Let’s do the retrospective of 2017! It is the end of 2017 and the moment to do the retrospective of a year that is almost behind us. 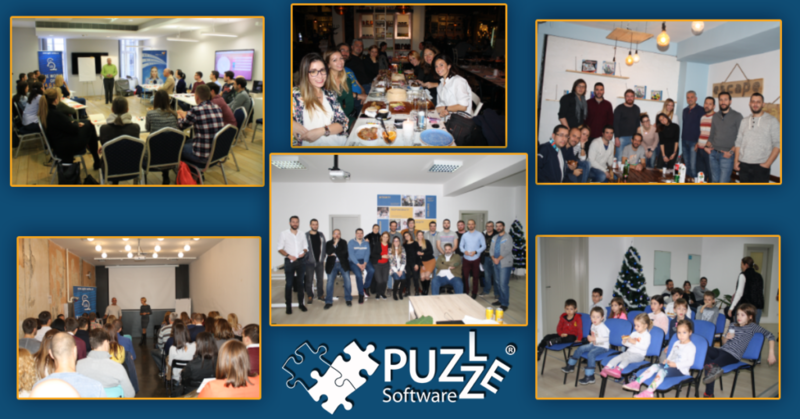 For Puzzle Software, it is a year worth to remember. Why? Because, once again, we did a lot of stuff! First, the most important aspect of our company – our people. Every month we grow and have new pieces of our puzzle. Also, this year we have launched new projects, and one of them is a start-up we are currently working on. It is an event activation application that will engage and connect event organizers, moderators, lecturers, and visitors in an innovative way. We can already claim its usefulness, especially to business people. In order to develop this start-up, we need reinforcement, and in that sense we are also expanding the team. Let’s move on to another field of our business – Agile Education. We can proudly say that Agile Serbia Conference definitely has become the biggest Agile event in the region. The second one was organized on the 26th of May 2017. This time, there were over 500 attendees from 12 countries across Europe and 16 great international speakers! The keynote was Dr Alistair Cockburn – a signatory of the Agile Manifesto, and one of the “All-Time Top 150 i-Technology Heroes”. Furthermore, we successfully organized two Agile Months – May and November 2017. For the first time, in Southeastern Europe, we organized Certified Agile Leadership Course! The course has proved to be very interesting to the leaders of companies or teams who want to implement agile transformation, or to work on the personal development and development of their team and organization. As you know, we are also well-known for IT outsourcing services. Regarding that field, in this year we expanded our pool with two new clients. Recently, we have started an Agile transformation in United Cloud company. At the moment, we are celebrating great year and expecting even better one!